Advanced Skills Batting Tee - Used By Over 3,000 High Schools and Colleges! Used By Over 1,200 High Schools and Colleges! 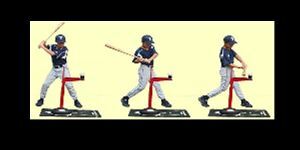 The AST (patented) is unlike any other baseball swing trainer available. Designed to help experienced players perfect their bat skills and beginning players to learn proper mechanics, a forward arm and outside swing barrier simultaneously eliminate both "dipping" and "casting". And, the height adjustable (24"-40"), movable arm positions the ball anywhere across the strike zone to realistically represent inside and outside pitch locations. Use the AST to build a compact swing, keep the "hands inside the ball" and develop a "quick" bat. Use it to increase bat speed and learn to "hit the ball where it's pitched". Includes a two-year warranty! Order You New AST Now! Need Assistance? Please feel free to call our toll free customer service number at 1-877-431-4487.